Interview the customer if possible, to determine the conditions that exist when the noise occurs. Use the Diagnostic Worksheet during the interview to document the facts and conditions when the noise occurs and any of the customer's comments; refer to IP-10, "Diagnostic Worksheet". This information is necessary to duplicate the conditions that exist when the noise occurs. • The customer may not be able to provide a detailed description or the location of the noise. Attempt to obtain all the facts and conditions that exist when the noise occurs (or does not occur). • If there is more than one noise in the vehicle, be sure to diagnose and repair the noise that the customer is concerned about. This can be accomplished by a test drive with the customer. • After identifying the type of noise, isolate the noise in terms of its characteristics. The noise characteristics are provided so the customer, service adviser and technician are all speaking the same language when defining the noise. • Creak – (Like walking on an old wooden floor) Creak characteristics include firm contact/slow movement/twisting with a rotational movement/pitch dependent on materials/often brought on by activity. • Rattle – (Like shaking a baby rattle) Rattle characteristics include the fast repeated contact/vibration or similar movement/loose parts/missing clip or fastener/incorrect clearance. • Knock – (Like a knock on a door) Knock characteristics include hollow sounding/sometimes repeating/often brought on by driver action. • Tick – (Like a clock second hand) Tick characteristics include gentle contacting of light materials/loose components/can be caused by driver action or road conditions. • Thump – (Heavy, muffled knock noise) Thump characteristics include softer knock/dead sound often brought on by activity. • Buzz – (Like a bumble bee) Buzz characteristics include high frequency rattle/firm contact. • Often the degree of acceptable noise level will vary depending upon the person. A noise that a technician may judge as acceptable may be very irritating to the customer. • Weather conditions, especially humidity and temperature, may have a great effect on noise level. If possible, drive the vehicle with the customer until the noise is duplicated. 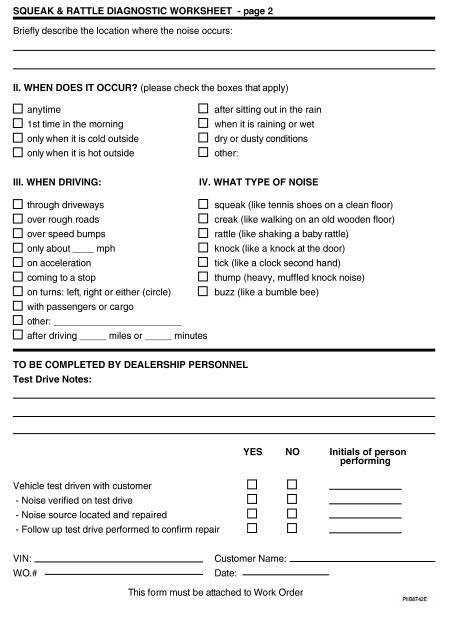 Note any additional information on the Diagnostic Worksheet regarding the conditions or location of the noise. This information can be used to duplicate the same conditions when the repair is reconfirmed. 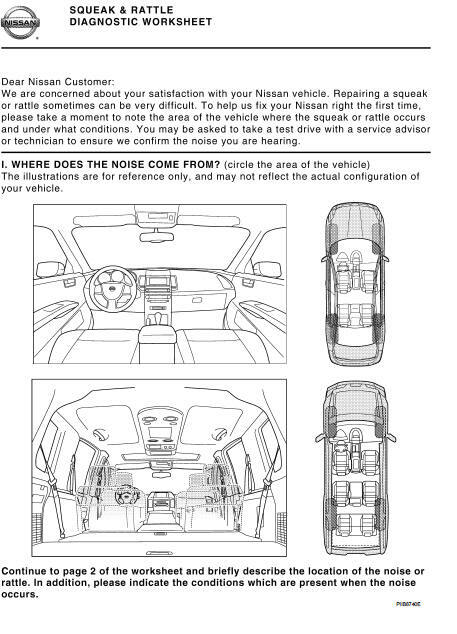 If the noise can be duplicated easily during the test drive, to help identify the source of the noise, try to duplicate the noise with the vehicle stopped by doing one or all of the following: 1) Close a door. 2) Tap or push/pull around the area where the noise appears to be coming from. 4) Use a floor jack to recreate vehicle “twist”. 5) At idle, apply engine load (electrical load, half-clutch on M/T model, drive position on A/T model). 6) Raise the vehicle on a hoist and hit a tire with a rubber hammer. • Drive the vehicle and attempt to duplicate the conditions the customer states exist when the noise occurs. • If it is difficult to duplicate the noise, drive the vehicle slowly on an undulating or rough road to stress the vehicle body. 1. Narrow down the noise to a general area. To help pinpoint the source of the noise, use a listening tool (Engine Ear or mechanics stethoscope). • Removing the components in the area that is are suspected to be the cause of the noise. Do not use too much force when removing clips and fasteners, otherwise clips and fastener can be broken or lost during the repair, resulting in the creation of new noise. • Tapping or pushing/pulling the component that is are suspected to be the cause of the noise. • Feeling for a vibration by hand by touching the component(s) that is are suspected to be the cause of the noise. • Placing a piece of paper between components that is are suspected to be the cause of the noise. • Looking for loose components and contact marks. Refer to IP-8, "Inspection Procedure". • If the cause is a loose component, tighten the component securely. • If the cause is insufficient clearance between components: - Separate components by repositioning or loosening and retightening the component, if possible. - Insulate components with a suitable insulator such as urethane pads, foam blocks, felt cloth tape or urethane tape. These insulators are available through the authorized Nissan Parts Department. Never use excessive force as many components are constructed of plastic and may be damaged. • INSULATOR (Foam blocks) Insulates components from contact. Can be used to fill space behind a panel. Used to insulate where movement does not occur. Ideal for instrument panel applications. The following materials, not available through NISSAN Parts Department, can also be used to repair squeaks and rattles. Insulates where slight movement is present. Ideal for instrument panel applications. Used in place of UHMW tape that is be visible or does not fit. Note: Will only last a few months. Used when grease cannot be applied. These incidents can usually be located by tapping or moving the components to duplicate the noise or by pressing on the components while driving to stop the noise. Most of these incidents can be repaired by applying felt cloth tape or silicon spray (in hard to reach areas). Urethane pads can be used to insulate wiring harness. Never use silicone spray to isolate a squeak or rattle. If the area is saturated with silicone, the recheck of repair becomes impossible. Components to pay attention to include: 1. Shifter assembly cover to finisher 2. A/C control unit and cluster lid C 3. Wiring harnesses behind audio and A/C control unit The instrument panel repair and isolation procedures also apply to the center console. Tapping or moving the components or pressing on them while driving to duplicate the conditions can isolate many of these incidents. The areas can usually be insulated with felt cloth tape or insulator foam blocks to repair the noise. Trunk noises are often caused by a loose jack or loose items put into the trunk by the customer. When isolating seat noise it is important to note the position the seat is in and the load placed on the seat when the noise occurs. These conditions should be duplicated when verifying and isolating the cause of the noise.